Can a modern army take a WW2 army? This is the question we've never bothered to ask with all the narcissism surrounding our war fighting capabilitys, and how they have supposedly made quantum leaps over the decades. Recent literature indicates that in spite of the surge in some of our technical abilitys (including air power, logistics, smart bombs, networked C3I), there has actually been a net decline in our war fighting capabilitys at large. There are many tactical idiosyncrasys which could illuminate why this is, but they are highly specific to each army, and would not have much importance with a broad overview like this. Rather than naming a specific army from each time ficton and putting them up against each other (which would be too vulnerable to nitpicking), we will avoid such an approach in favour of identifying the tactical and technical trends in each force: That means no nuclear ordnance, and no biological or chemical weapons! Such a setup allows us an opportunity to see how rusty our armys have become as measured against their WW2 peak. In terms of infantry quality, they are nearly equal. Assault rifles, body armour, night vision goggles, and lightweight equipment give us the edge, but its far from a decisive one. WW2 armys benefit from using full power rifle, carbine, and machine gun ammunition (with a commensurately higher stopping power and barrier penetration), as well as man and vehicle mounted flame throwers for breaking sieges, and immediate support from infantry guns. These are rather short ranged cannons which perform both direct and indirect fire missions, something that neither mortars or shoulder launched rockets together can do. Also, it bears keeping in mind that the seeming advantages of the moderns may be illusory. For instance, merely wearing body armor does not ensure your complete safety from small arms fire, even if the vest is technically up to the job. After all, many gunshot injurys afflict the limbs and the head (especially if the soldier was behind cover before he was shot), and even if hit directly in the torso, the blunt force of the impact is usually brutal enough to take the soldier out of the fight and render him non mission capable. That is just one example of many. Remember, there are no guarantees in a fight! In terms of infantry quantity, however, the moderns lag far behind. The WW2 battlefront was simply gargantuan. At its peak in late 1941, the german army was employing 154 divisions, 115 of whom were infantry! (This was just what they sent aganst the russians, BTW) At its peak in early 1945, the US army was employing 90 divisions, 70 of whom were infantry... For comparison, the modern day german army has just 6 brigades, while even the US army -the 4th largest in the world- only has around 45 brigades. Modern brigades essentially serve the same role that a small division used to, so it would not be unfair to measure them in a one on one fashion. This being the case, we can see that germanys military is about 1/40th its previous size, while the US military has easily been cut in half. That is a very discouraging force ratio which could have all kinds of negative consequences for us, beyond simple attrition. Josef stalin put it best: 'Quantity is a quality all of its own.' Without very favourable terrain, or constant shock action, a 10 fold disparity in numbers makes it virtually impossible to wage a pitched battle. This would be bad enough on its own, without the additional complication of most of our infantry being located in mechanised or motorised (rather than foot mobile) units. Such restrictions mean that modern armys would not be able to maintain a continuous front line. Strategically and operationally speaking, they would instead be left to roam about in large battle groups, while the OPFOR flooded around them in a situation akin to moses and the red sea. That is not good. Strategic mobility would be servely impeded, supply lines would be smothered, encirclement would never be more than a breath away, and COs would be shitting bricks... But these concerns can be waved aside for now, since this posts intention is only to examine the tactical finesse of these two separate militarys. Even so, this still leaves us with the daunting prospect of 1 modern brigade facing off against half a dozen or more divisions! At this point, some would undoubtedly try to bring up the issue of the US militarys high kill ratio in combat, which might be an adequate compensation for their numerical disadvantage. We must caution that in war, however, victory depends largely on whether or not you are able to achieve stated objectives, not on whether you kill a large number of enemy soldiers. Putting that more simply, attrition can only be a means to an end, not an end in itself. Accepting that caveat, however, it might still be possible for the moderns to level the playing field by copying the strategy of the german army at verdun, and utilise their artillery in an effort to bleed the opposition white and degrading their readiness for future engagements. Now, lets move onto armor. WW2 tanks, of course, have no hope of defeating MBTs in anything remotely resembling a straight up fight. Their progeny are not only faster, but more heavily armed and armored. They can fire accurately while moving at speed, and their long rod penetrator shells would bore a hole clear through a vehicles armor and ignite everything inside. 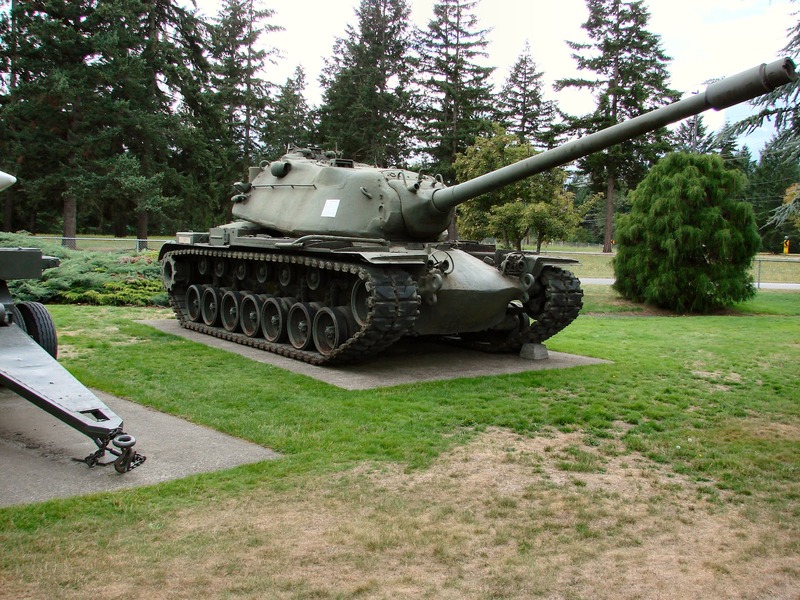 A sherman or t-34 would only have a chance at destroying MBTs by creeping up on them at close range, and taking a shot at their rear armor, a tall order for most tank crews. Infantry forces would be even worse off, since their most popular anti-tank weapons (the high caliber rifle or shaped charge warhead) wouldn't be able to penetrate even the thinnest plates of armor. Even so, the advantage of having tanks which can roam about the battlefield nearly unopposed is diminished if our infantry, engineers, reconnaissance and support troops cannot do the same. In a way, combined arms practise is detrimental to any MBTs attempting to rampage behind enemy lines: If or when they shatter the enemy through shock effect, the armored column would not be able to pursue them and exploit their success to the fullest. Instead, they would be forced to stay behind and create a working environment for the reserve forces, mopping up enemy troops along the way. Moreover, these vehicles can still be disabled and/or destroyed by anti-tank mines, as well as fire from 6 inch howitzers. Clumsy pieces to manager into position, to be sure, but a direct hit could potentially blow the tanks turret off, due to the shells combination of explosive filling and sheer momentum. That is the rundown on how a modern armored brigade might fare against a WW2 formation. But obviously, theres no need to do the reverse, since WW2 armored divisions are composed of such flimsy vehicles. Theres no way they could even remotely threaten us... Right? Well actually, since our armys have NO dedicated anti-tank formations, its fairly likely they could. Some would undoubtedly object to this statement, pointing out any number of ATGMs and PGMs in use, but that would be missing the point: We have various weapons systems that are capable of destroying tanks, but which do not have the benefit of being structured into a relevant command structure. As jim storr said: 'Anti-tank weapons destroy tanks, while anti-tank troops protect units and formations.' Thus, the moderns will have have no shield to protect their body from an attack that comes via a column of shermans, or panzer 4s, or t-34s, or churchills. In fact, most mechanised/armored brigades as a whole suffer from deficient security in their flanks and rear, due to their increased reliance on a small number of major weapons systems (which are spread thin in a vain attempt to provide both offense and defense). This is important to keep in mind, because the main purpose of a tank is to penetrate enemy rear areas, and bring cannon + machine gun fire to bear on soft targets. And a 75mm tank gun, puny as it is compared to the 120-125mm long barrels of the modern MBTs, is still capable of destroying most anything that pops up on the battlefield. Artillery. WW2 divisions have a much more diverse array of artillery than us. Although heavier and less capable than our guns, commanders aren't restricted by the one caliber fits all syndrome that has afflicted modern forces, with our clear predilection for 155mm weapons. They generally have four to choose from: 75mm, 105mm, 155mm, and 203mm. Decent weapons that work well within their respective niches, rather than being bent out of shape to function as an unrealistic all purpose piece, which is more than we can say. Precision guided munitions are useful, but they are also expensive, and not available in great quantitys. For regular battlefield use, PGMs probably aren't even needed -other than for fleeting or high value targets- seeing as the precision of modern guns is already so far beyond that of their WW2 peers. Given sufficient forward observation, they can be expected to be extremely accurate, dropping shells right on top of the enemy. With the first barrage. The super long range of todays howitzers will also prove helpful in the defense, since artillery has always been the primary backbone of a thin defensive line (and our forces WILL be spread very thinly). Unfortunately, these advantages might not impress an enemy which has so many pieces of artillery as to group them into independent divisions (!). Our shell stocks will also not be up for a protracted conflict, unlike the WW2 nations whose ammunition reserves had been brought up to peak levels, by virtue of having the time to dial their industry up to the task. Airpower. This has two components, fixed and rotary winged aircraft. Modern helicopters will be put at high risk from the WW2 armys unusually heavy concentrations of AAA, quantitys which just aren't seen on todays batlefield. They may not have the advantage of radar guidance, but like all artillery of this period, they are available in a wide range of different calibers and effective ranges, which would make a helicopter squadrons navigation across active battlefields a nightmare. Modern fighters would presumably have a field day against their WW2 adversarys, although they will be heavily outnumbered, and had thus better not get shot down or waste ammunition. In the long run, jet fighter squadrons may not be able to maintain the necessary sortie rate and operational tempo to keep the enemy on the defensive, by virtue of their typically low mechanical reliability and small numbers. On other fronts, close air support and interdiction craft would be right at home in this environment: They are superbly well designed and capable in their niche roles (although only the americans field a really substantial number of them), and operating in target rich theaters like this are exactly what they were built for. Of course, this also holds true for their enemy, some of whom fielded a ground attack force with many thousands of aircraft! A smart modern force could (in a conventional war) play its strengths and use economy of force with delay mission to wear down the WW2 enemy to the point where the modern force is superior. Nighttime attacks, dominance of open areas with MBTs and artillery counterfire would have great prominence. Terrain with short lines of sight would be avoided at daylight. This merely takes enough strategic depth. Btw, WW2 armies did not necessarily have much ammunition. They were originally built more for peacetime display of strength than for actual wartime preparedness, especially the German one. The German ammunition situation was horrible after less than four weeks of campaigning in Poland. 'Nighttime attacks, dominance of open areas with MBTs and artillery counterfire would have great prominence.' Yes, thats all well and good. But without the support of our own tanks, we would be at the mercy of an AFV attack. A few grunts with RPGs (or some sniping by arty with copperhead or bonus rounds) are not a satisfactory defense against that! Further, we are fighting against enemys as smart as ourselves, so they will be aiming to play to their strengths as well as we are. Who has to work harder to hit their operational stride? I'm guessing thats gonna have to be us. Overdrawn, bloated, and vulnerable supply lines will be a tempting target for them. Worse yet is that modern forces are much hungrier and more wasteful than their WW2 peers. 'Terrain with short lines of sight would be avoided at daylight. This merely takes enough strategic depth.' Agreed. Man to man combat should be avoided as much as possible. We have no advantage in such scenarios, and they are better able to whether the attrition. But wouldn't your stratagem leave many vulnerable salients in the front lines? Heck, with our low force density, would we even be able to MAINTAIN a continuous front line? Also, I don't think you properly addressed their huge numerical advantage, or the ample direct fire support they have via assault guns and infantry howitzers. Our shoulder launched rockets CANNOT duplicate this role. As a side question, do you really think we are tactically and doctrinally more sophisticated than at our WW2 peak? I am worried that we have actually degraded! You don't need infantry guns if your infantry fights predominantly at night anyway. The numerical difference isn't too stark in regard to overall figures. A mobilised modern army is in no worse quantitative relation to a mobilised WW2-era army than the Germans were on the Eastern Front in 1945. They still managed to delay a lot, despite at that point inferior mobility (modern army would have superior motorisation). The quantitative difference is a problem first an foremost regarding line of sight teeth. A modern division has thousands of vehicles and thus thousands of drivers. It's like a cavalry division which had to leave many of its men behind to control the horses during a dismounted fight. Still, dismounted advance cannot be much more than 10 km/day, and a WW2-era army could simply not advance against a modern army with use of much motorisation. The huge difference in tech and motorisation negates many skills (and many WW2 armies were quite incompetent with extremely quick training for NCOs and even lieutenants). 'You don't need infantry guns if your infantry fights predominantly at night anyway.' Well, your entitled to your opinion, but I do not necessarily agree with this. The pre-requisite conditions to enable confrontations that take place exclusively at night time remain to be proved. 'A mobilised modern army is in no worse quantitative relation to a mobilised WW2-era army than the Germans were on the Eastern Front in 1945.' Sven, barring the use of conscription, there is no way in hell that a modern army will be able to grow in size by more than an order of magnitude. There are multiple reasons to explain why. One of them is the (currently) high cost of force protection. Go ahead and google that, watch the capital $ per soldier that come up, they're 100-200 times higher than in WW2. The other is that people are not as naive today as they were 70 years ago. They've all seen the ultra realistic war movies, and read the gory memoirs of soldiers. Only the unusually brave, dumb, or desperate will be willing to sign up for a major war. In any case, my scenario was based on the assumption that modern armys will be more or less the same size they are now. The issues this raises with being unable to maintain a continuos front line are thus a valid one in this context. The salient question remains. I am still curious as to your personal thoughts regarding whether we really are doctrinally more sophisticated than at our WW2 peak. For example, we have certainly degraded in the area of anti-tank defense: There are no dedicated formations to provide protection against AFVs. This is a SERIOUS miscalculation, as are the ponderous and defenseless supply lines. The personnel costs don't matter that much. They rise because the overall economy's productivity grows and because of inflation. To remove one healthy working-age person from the economy has no drastically greater effect today than it had decades ago. Actually, the problems caused are likely to be much smaller, for industry and agriculture require now very few personnel and it would mostly be the relatively dispensable services sector that would lack the manpower. Concerning the doctrine thing; sure we are more advanced, albeit some additions will likely not stand a baptism of fire well. The problem is in my opinion rather in the ability to actually make good use of the pool of the known art of war. To know about armour raids helps little if you have commanders who build ultra-defensive networks in chess (a bad habit of mine, btw). Risk aversion, a senior officer corps more optimised for peacetime promotion than for war, an overemphasis of expensive equipment (because of industrial influence) and a general unwillingness to consider a European-style major conventional war as a realistic scenario for this generation are among the big problems. I'm more concerned by the sadly small share of smoke shells in artillery and mortar supply inventories and similar details. I enjoyed reading your post and I hope not too much time has passed for you not to see my reply! It's an intriguing question and one that had me pondering it via a google search...it's a long story. I liked your argument but I have to say that I disagree! My argument is perhaps predictable...but quite simply technology has moved on leaps and bounds since the 1940s. Command and control capability in modern 21st century forces is huge, particularly in NATO (and I'll use NATO as the basis for my argument). Computers and the internet has moved things on in a truly epic sense. First strike capablity and the capactiy to destroy vast targets with precision would render World War 2 armies useless before they knew what hit them. Their command and control would be very quickly incapacitated. Satellite and reconnaissance capabilities would mean any world war 2 armies would be always tracked. Quite simply the modern army would always be several steps in front. Sure helicopters in theory would be vulnerable to heavy machine gun fire but gunships like the Apache or the Eurocopter Tiger would destroy artillary, infantry and tank formations from afar. The world war 2 enemy wouldn't know they were there. You rightly pointed out that modern aircraft would have a field day but we wouldn't be talking about a classic ww2 dog fight. Again enemy airfields, command and control and formations would be destroyed without the enemy knowing what had hit them. Other aircraft would also run riot - imagine what a C130 Spectre Gunship would do to world war 2 tank formations?! On the battlefield, there is no doubt that the weapons deployed in world war 2 are still as capable of taking human life as they were then. For example, the modern German machine gun is simply an updated version of the MG42. But none the less and yet again, superior command and control and information would make itself convincingly felt in a huge way. Modern troops and armour would simply always be ahead of their adversaries. On top of this they then have far superior technology as was noted when it came to engagement. In terms of artillary the modern MLRS systems remove entire grids! And they do this through the use of cutting edge techology, ranging and...information. The idea of a protracted war and the need for huge stocks for me is a non requirement. Think shock and awe. I simply think world war 2 armies would quickly capitulate under a seemingly invincible enemy. Stalin barely held his forces together under the German advance into Russia. A modern Nato force would have the impact of the Wermacht many, many, many times over. Sure if you were taking this to the enth' degree, you could argue that the ethics of war have thankfully changed (in the west at least) and that we just wouldn't be ruthless enough to deploy our full might. But if we were, it would be one sided in my opinion. 'I enjoyed reading your post and I hope not too much time has passed for you not to see my reply!' Thanks for the compliment, and no, LOL, I don't have any problem answering questions which come some months after I post my articles. I'm always open for discussing my ideas with other free thinkers. 'My argument is perhaps predictable...but quite simply technology has moved on leaps and bounds since the 1940s.' It has indeed! One thing which I neglected to take into account was the fact that, unlike in WW2, most land forces today are heavily mechanised and motorised. My esteemed colleague sven ortmann (who you may have seen conversing with me above) wrote a very good post on his blog about this, and how it will be nearly impossible to cripple that critical asset, as the russians had done to the germans in late 1941. The loss of most of the wermachts motor vehicles is part of what catalyzed their shift from offensive to defensive operations, which is why we must not underestimate the importance of these things! That article (called, interdiction today) was written before I released this post, so yeah, it is something that looks obvious in hindsight. Modern armys will be much more mobile than their WW2 peers. Their ability to execute high temp operations will be of critical importance. Against such a numerically superior foe, they will have to trade attrition for maneuver. Float like a butterfly, sting like a bee. 'Computers and the internet has moved things on in a truly epic sense.' Maybe, maybe not. It all depends on how the digitisation process was implemented. In the british army, for example, the move to network centric warfare was a disaster. What we really need is a command system that binds disparate talents and personalitys together into a synergistic team, not more transmission capacity. 'First strike capability and the capacity to destroy vast targets with precision would render World War 2 armies useless before they knew what hit them.' Hmm, I've heard legions of RMA acolytes (and esteemed military institutions) claim the same thing, but there is much evidence which contradicts that assertion. Even if this was not the case, dispersed forward observers acting from LAVs, and calling in precision artillery bombardments, would (at best) only be proficient at delaying an enemy force, not mounting actual offensive operations. They don't have the tactical mobility, mass, or diverse repertoire of skills needed. Even then, all is not well. Taking a static, defensive stance against the WW2 force is a very risky proposition. The moderns tooth to tail ratio and dependency on major weapon systems (as opposed to masses of infantrymen) makes it quite simple for an opponent to achieve breakthrough/shatter them. A modern brigade that lost more than 200 men and 20 or so tanks would be forced to retreat, and could be dissolved in a skilled pursuit because its few fully combat capable elements could not hope to provide adequate security to the many soft components any longer. 'Satellite and reconnaissance capabilities would mean any world war 2 armies would be always tracked.' I tended to believe that myself sometime ago. But, as it turns out, when a formation is moving at the upper limits of its operational mobility, there is a strange degradative effect on their reconnaissance capabilitys: Time frames are shortened, and recce units do not have enough preparedness to organise and deploy (so that they can scout out the enemy in a timely manner). As a consequence of that, their parent unit has an impaired situational awareness (which is not rectified by help from AWACs or JSTARS platforms), and they have a bad tendency to blunder right into the middle of an enemy force. At the brigade level and below, the recce capabilitys are definitely inadequate. While the scout units LRASS optics are fantastic (! ), there are issues associated with the intelligence dissemination that comes from higher command, in a top down manner. Due to the brigade and battalion HQs lack of sizeable bandwidth capabilities, their information bottle-necks down to what can only be transmitted over a voice radio net. Not good! 'On top of this they then have far superior technology as was noted when it came to engagement.' Having a technological edge is certainly nice to have, but mastering the discipline of warfare involves much more than a familiarity with gadgets. As stated by the eminent jim storr: 'War is complex, adversarial, lethal, dynamic, and evolutionary. It is fundamentally human, and waged between complex human organisations. Most critically, it is NOT determined by technology alone.' Other factors are of much more importance. 'The idea of a protracted war and the need for huge stocks for me is a non requirement. Think shock and awe.' Effects based operations, in other words? One must be approach this military fad with great skepticism. My impression of EBO is that it is a very disorderly concept, jam packed with buzz words, hyperbole, and paradox. Colin gray is quite articulate in his detractions of the EBO model. 'A modern Nato force would have the impact of the Wermacht many, many, many times over.' Actually, NATO would require participation from ALL their constituents just to muster a fraction of the numerical force assembled by germany for its operation barbarossa. I have reasons for believing that, even with full mobilisation, NATO would not be able to increase its current size by more than a factor of four or so. With that said, feel free to comment on the variety of other articles here at my blog (I'm quite random in what I write about). If you have any recommendations for topics that could be done in the future, I'm open for suggestions. This is a non argument to be honest. just look at home the USA destroyed the Iraqi forces in the first and second gulf wars. The then Iraqi forces were 70s standard. Even 70's standard were rubbish against modern army, just how would a WW2 force fair? I can only imagine the helplessness of the aged solders. The problem with your thesis is that equipment isn't the principal agent for an armys success: Fighting power is. The iraqi army of 1991 had better equipment than the germans of 1944, but their fighting power was greatly inferior. Arab armys are typically much less competent than their western peers *, and the iraqis were no exception. They repeatedly showed themselves to be staggeringly inept at all levels of war, deficient in leadership skills, training, cohesion, initiative, command staffs, and many other qualitys. The iraqis performance in the gulf war was the subject of scathing reviews from stephen biddle and james f. dunnigan, who has since come to believe that they were doctrinally no more advanced than the french army of 1918! Quick response! and interesting topic too...I still don't agree with you though. At no point in human history has technology moved on in such an unparalleled, rapid way since the dawn of the computer era. One of the topics I like to chew over is whether the Imperial Roman Legions at their strongest, would have beaten a medieval army. It's an interesting debate and whilst technology had moved on over the several hundred years that seperated them, it hadn't moved on all that much. It's another topic but you could argue it both ways. However in a much shorter period of time i.e. the technological gulf that seperates 1944 from 2012 is huge. I take your point about the fog of war, but overwhelming first strike capability coupled with devastating munitions would win the day in my opinion. I'm sticking to this argument! We know from history that war isn't just a numbers game either so I don't consider that an advantage. Even at infantry level, modern troops simply have so many advanatages. In terms of equipment, clothing, logistics, food, protection and weaponary. Training? I think you could argue the case because the lessons used now are on the basis of the hard ones learned in history. The NATO soldiers are also now almost all professional. So in the UK, our forces are all volunteers. In world war 2 there were many conscripts. If you haven't already read his work, Max Hasting gives quite a sobering view of the reality of using conscripts. Not all our soldiers were as plucky and up for beating the 'hun' as posterity would like us to believe :) However in saying all of that, I wouldn't for one minute diminish the fighting capability of many ww2 armies. The Wehrmacht in particular was formidable. With regards to shock and awe...ok so there were severe limitations of the US led plan in Iraq. But from the point of view of beating Iraq's standing army, it was absolutely smashed and it happened very quickly. Saddams army was starved of resources but it still had many relatively modern pieces of equipment and at any rate, even its 'ancient' equipment was still post ww2. However American/UK first strike capability and superior coalition command and control left the Iraqi's rudderless. The point is, I don't see how any ww2 army would fare any better? This is the stupidest thing I have come across all week. The author seems to think the armies would line up with frontline equipment in an open field, wait for the other side to get ready and go at it for an afternoon. When in reality the WW2 army would have few if any logistics, air, artillery or command elements in tact by the time the ground troops made contact, the WW2 army would be utterly impotent long before anything like tank and infantry numbers mattered. Look at the 1991 gulf war, at least then the US and UK had to worry about Iraqi SAMs and Jet fighters. In this scenario they could just bomb with utter impunity, not even hampered as much as they are in places like Afghanistan. These two posts might make you reconsider the pre-eminence of strategic and operational level air campaigns. "WW2 divisions have a much more diverse array of artillery than us." Not only is this a trivial issue, but we actually have 105mm howitzers in addition to 60/81/120mm mortars. Almost all WW2 bombardments were done with these sizes of guns anyway. This gives a good enough range of capabilities for missions on the battlefield. We can also analyze enemy artillery trajectories to perform immediate counter-battery fire! So that's it for enemy arty. The reason we don't use anything larger than 6.1" isn't because of "one caliber fits all syndrome" (first time I've heard someone object to that; it actually makes supply and logistics easier), it's because we're no longer trying to blast apart long lines of enemy trenches and fortifications, and if we did then we would use air power anyway. Which brings me to the next point, which is how conveniently handwaved the influence of airpower. A single A-10 can carry enough 30mm ammo to render an entire WW2 heavy tank company impotent; an Apache could do so against light or medium tanks, and the thought of an AC-130 here makes me wet. Nevermind the fact that they could also carry plenty of Maverick or Hellfire missiles. This kill capability negates the one advantage of WW2 armor, which is their numbers. But even if there's really bad weather or something and there is no air cover to annihilate the enemy tank attack, what are we going to do? Well, as you said, there are various anti-tank weapons, and even the ubiquitous little M203 would be capable of penetrating the armor of any WW2 light tank, armored car, or halftrack. But you're complaining that they're not "attached" to the units so they can't defend it? They actually are integrated with maneuver units... you have no understanding of how AT weapons are integrated in a modern army. Besides, we would meet them out at long range anyway before they could attack: MBTs are much faster than WW2 tanks, and would outmaneuver them and meet them at long range. Even IFVs are capable of knocking out WW2 tanks (they did destroy many T-54s and T-55s in Iraq). Lastly, the poor armor and mobility of WW2 vehicles would make them more susceptible to artillery bombardments, which hinders their one viable tactic (overwhelm infantry with a massed attack). A hit on a tank with a howitzer is probably implausible from any distance over 1km away, while an MBT can engage targets over 3km. The mobility of MBTs and their ability to attack anywhere regardless of enemy positions would make minefields less practical. A WW2 tank shell's blast radius is generally going to be similar to that of a single mortar shell or RPG, so if it ever comes up on infantry, it might kill a few, or even knock out an IFV. But don't forget that WW2 guns were very inaccurate compared to today's. You would generally be quite lucky to get a first-hit kill on a STATIONARY vehicle beyond 500m, which gives Sergeant Snuffy plenty of time to get his 25mm Bushmaster lined up and ready to fire a few clips at Oberleutnant Ulrich's little panzer. Regarding small arms, there is a big difference in firepower actually. An assault rifle will quickly put much more lead on target than a cumbersome bolt action, which even in 1945 was still the most common weapon on the battlefield. We also have much better use of M203s and similar grenade launchers. Another point is the value of air recon. Besides the capabilities of modern surveillance, think about how blind and helpless a WW2 army would be when all its planes are shot down. Two final points: WW2 tanks were less reliable than modern tanks, and WW2 armies were composed with conscripts while modern Western armies are better motivated, better trained all-volunteer forces. So no. There is no way that a WW2 army would beat a modern army in a conventional war. The US army currently has about 2000 155mm howitzers. The russian army in WW2 had about 11,500 152mm howitzers. And do you know how many 76mm field guns they produced during the war? It was 103,000. That is a huge advantage in the sheer volume of artillery they can bring to bear. If you want a clue on what kindof edge that can give, just look back at what the russians were doing at the battle of kursk! They had enough howitzers and ammunition to perform all kinds of missions: Precision fires to take out forward outposts, pre-emptive barrages to disrupt marshalling areas, and saturation of all approach avenues to deny them to the germans. While modern armys enjoy all kinds of advantages in the quality of their artillery pieces, that simply isn't going to make up for their huge numerical disadvantage. You can't have them performing counter-battery missions all day in an attempt to achieve parity with the enemy artillery, thats just going to leave your infantry and tanks vulnerable and without fire support. The modern trend of using only 105mm and 155mm howitzers leaves some pretty obvious gaps in capability that you won't find in a WW2 army. The artillery branch isn't as well rounded as it used to be, and most of these pie-in-the-sky weapons programs they run are a misguided attempt to put a square peg into a round hole. As for the air interdiction and CAS stuff, you really should read the articles that were listed previously. They go over alot of the operational and strategic pitfalls of air support. If you want to stick to just the tactical level, you should try elaborating some more. What mode of attack will the apaches be using? Will they use fire and forget missiles and then duck behind cover? Will they get as high as they can and use cannon fire from standoff range? Or will they try infiltrating the enemys rear areas in the hopes that they can catch a supply column or some combat troops at rest? All of these methods have their own risks and complications, as we saw during the battle of najaf. It took only 1 bungled attack for the 11th aviation regiment to suffer 29 damaged apaches, and be rendered combat incapable for an entire month. I will focus solely on "2000 155mm vs 11,500 152mm howitzers" argument, because it pretty much sets an example for extremely uninformed and biased opinion you present. I cannot, for one, understand what edge 5 times as many old ww2 howitzers with simplest, unencypted radios, lobbing dozens of shells at aproximate location of enemy forces to compensate for terrible accuracy have over modern 155 mm howitzers that operate in C4i environment with real time data, outrange enemy artilery of the same calliber by several magnitudes, achieve close to 100% accuracy within 100m impact radius, have several means of achieving a lock on enemy artillery positions (counter-battery radars, UAV's, specialised recoinnesance units with night vision/infrared cameras, surveillance radars, acustic detectors etc etc.) can deliver MRSI salvos with precise munitions AND with much higher sustained rate of fire, unparrarelled tactical and strategic mobility... All that regardless of day-night cycle. "You can't have them performing counter-battery missions all day in an attempt to achieve parity with the enemy artillery, thats just going to leave your infantry and tanks vulnerable and without fire support." Of course you can't because there's no parity. None. Zero. Nada. WW2 artillery simply can't return fire. It had to be massed in order to achieve saturation neccesary for achieving firing effect over the course of several hours, WW1 style (see soviet offensives). Which incidentally is exactly what makes it a perfect target for modern artillery with precise data on enemy location, superior mobility and range and modern cluster munitions. About the gun count. For the russians, I used four different models of 152mm: The M1909/30 (obsolescent), M1937, M1938, and M1943. For the americans, I used two different models of 155mm: The M109 and M777 (the M198 is in declining service). The numbers listed are only a ball park figure. I am aware that modern artillery is altogether superior to WW2 era artillery, but you are overstating your case, especially with regards to range. Lets compare the most numerous guns of both sides, the M1937s and the M198s. The former has a range of 17.2 km, the latter has a range of 22.4 km: Thats a disparity of just 5.2 km, hardly the 'several magnitudes' difference you boasted of. The moderns would require base bleed or even rocket assisted projectile to get a major advantage in range. Everything you say is true, with one exception: Modern artillery are not unique for having dedicated observation and reconnaissance assets. German artillery regiments had an 'observation battalion which is composed of a sound-ranging battery and a flash-ranging battery (each separable into 2 independent platoons), a survey battery, a reproduction platoon, a signal platoon, and a meteorological section.' Only in rare circumstances would a fire mission require more intel than their own recce assets could gather. Sorry my last comment was a wall of text so I deleted it. I think the WWII army would win. One overlooked factor would be parsians. First off yes, a spectre or some attack helis may decimate formations but there are only so many people you can kill before it takes a toll on you. The washout rate of trained pilots would probably sharply rise. Another factor is the rules of engagement. Parsians would have greatly increased effectiveness. When Erwin Rommel took control of the Atlantic wall the number of landmines were increased from 40 thousand a month to 40 million a month. This is a gargantuan number add that by the number of landmines on all fronts the Americans are screwed. Ieds took a toll on american forces in Iraq. Supply lines would be completely bogged down. Troops would have to be pulled from the front to protect the supply lines. Tanks and troops behind enemy lines could make a few highly effective raids. It would be Iraq times 1000. A few hundred Parisians has a significant impact on the Germans. In one raid they destroyed a train and a bridge destroying 100 tanks in the process. The sheer number of German, Russian and (WWII)American troops caught behind the lines would number in the thousands. It is debatable whether they could win an open engagement with sheer numbers maybe. Add parsians into the equation and they would most definently win. An interesting book that deals with this is Harry Turtledoves in the balance series. Aliens with modern american weaponry invade earth during WWII. They are not able to defeat the combined allied and axis soldiers combined. They eventually just nuked the earth. The point is they had many times the number of troops the modern american army AHS and they still couldn't win. Since nukes are not allowed in this scenario, the WWII soldiers would win. Partisans are a factor at the operational and strategic level. At the tactical level, though, modern armys are more at risk of overextending themselves and plunging so deep into enemy lines that they get isolated and cut off. This can happen even if the spearheads move only 2 or 3 km away from their own lines. If the WW2 army has enough morale to reform for a counter-attack, they could probably overwhelm and destroy these pockets. IEDs are really more of a demoralisation and harrassment weapon than anything else, since they are laid individually in areas frequented by the enemy, whereas mines are traditionally laid in fields in advance of where the enemy is expected to pass. Because of this, IEDs can't really be treated as area denial weapons. But it is true that modern armys have a softer belly than their WW2 forebears, since the individual units are all co-dependent on each other, and consume so much more material. In terms of infantry quality, they are nearly equal. Assault rifles, body armour, night vision goggles, and lightweight equipment give us the edge, but its far from a decisive one. <<<< what??? Body armour, assault rifles and nightvision goggles doesn't give a decisive edge? Then what does? A man-portable nuclear device? ok, maybe I am the stupid one there, but what edge does an bolt action rifle armed infantryman that can at best put a miserable 15 rounds/min at the target at 500 m effective range with iron sights against an enemy armed with, say, AK-74 with the exact same effective range, 600 rounds/min RoF, twice as much ammo and modern reflex sights? Does obsolete 7.62 rifle ammunition make up for it? Especially if body armour pretty much negates the stopping power it could have? Even an outadet M1 Garand was an outstanding improvement over bolt-action kar98k, which it entirely outclassed. And now you are trying to imply that an assault rifle - which, enables EVERY soldier to lay surpressive fire shoot several bullets in rapid succession is NOT a huge, definite edge? And we didn't even bring 40mm underbarell GL into equation. I could elaborate further, but my point is... go educate yourself. Assume that the german army of 1944 is fighting against the american army of 2012. The former has 7,000,000 men, while the latter has 750,000 men. For every 10 american soldiers on the ground, they will face 93 german soldiers. In light of such numerical imbalances, their technological superiority won't prove decisive. The WW2 force might take heavy casualtys, but they will overwhelm the modern force every time. Reliable communications are certainly nice to have for small units. Body armor is more relevant for its ability to protect soldiers from shrapnel and fragmentation. Night vision devices can be countered with trip flares and mines, which provide advance warning of an attack: Listening posts (pickets) surrounding the main body of troops is a problem, as are searchlights or parachute flares directed at their most likely avenues of approach. Having a good LOL, are we? In the mean time, others have actually done their research. Throughout WW1 and WW2, carbines were (for the most part) shortened rifles that used the same ammunition. See the mosin nagant M38, lee enfield No. 5 Mk I, and carcano M38. WW2 era rifles have the advantage of firing full power ammunition which can penetrate body armor and most urban barriers. Even ESAPI plates will not stop 'obsolete' 7.62x63mm, see this video: https://youtu.be/2C9rZ_v8XUc. The americans were standard issued with the M1 garand, while the germans were using the stg 44 in fairly large numbers. Reflex sights are nice to have, but only aggressive and skilled soldiers will use them to their fullest potential. Its the shooter that counts, more than his optics: Don't forget that some of the deadliest snipers in history (simo häyhä) used nothing but iron sights. Semi-automatic is 100% better than a bolt action, you'll get no argument there. But full automatic is only useful in close quarters engagements, I.E, when you are clearing out bunkers, trenches, and rooms. For most firefights, 15 RPM is all you need: Well aimed suppressive fire which conserves ammunition is much better than spray and pray. Infantrymen are not trained to excel at the role of suppression, and their marksmanship skills may even be poorer than the WW2 troops. As for grenade launchers, squads would be actually better off with one man wielding a milkor MGL, than every man wielding a M203. Computers. Modern computers would break the enigma machine and any other coded messages faster than the enemy could encrypt them. We would know every single one of their plans, and have total intellectual superiority. Every single maneuver of theirs would be countered perfectly. And they would have no clue how we did it, either. Air superiority is so vastly understated here, it's laughable. A modern military would simply bomb a ww2 army into submission. We have bombers that fly too high and too fast for anything 1944 could muster. They would quite literally be untouchable in ww2 standards. But why send a bomber when a cruise missile would do? Unmanned drones flying overhead, taking out hitler, stalin, Churchill and fdr before ground troops even engaged. Entire battleship groups decimated without any clue where the missiles came from. Factories, dams, munitions, batteries, airfields, really any and all infrastructure would be rubble within a week or two. It would be desert storm countless times over. Our technological superiority to ww2 is definitely present in the weapons game, but in a ww2 style battle, their numbers would account for something. Our tech superiority in communications and intelligence, however, makes a modern army seem more like an alien invasion to a ww2 army than simply a slightly more advanced version of them. Basically, a modern army going toe to toe with a ww2 army in a classic ground battle would be like a jedi going up against a dozen samurai, and then saying "ok I won't use a lightsaber, I'll just use a katana, and I promise I won't use the force either." It's fun to propose "what if" questions, then place parameters on it to get a desired result. Reality doesn't work like that, however, and in no universe would the past 70 years worth of military improvements be negated simply by superior numbers. The question at hand really is: "how long would it take before a ww2 army surrendered?"